Fortunately rain was nowhere to be seen in Le Mans, setting the stage for an exciting and eventful MotoGP race. The French GP comes after a post race test in Jerez and many riders arrived in France with new confidence, direction and parts. Bradley Smith was one such rider, running new front forks this weekend and leading FP2 on Friday. Marquez and Crutchlow both also had new swing arms. Round five of the MotoGP World Championship also saw Repsol Honda’s Dani Pedrosa return to the grid, the Spaniard having missed three rounds after having surgery to cure arm pump issues. Returning for Jerez had been a possibility, but a test on a Supermoto bike had Pedrosa and his Repsol Honda crew air on the side of caution and wait till Le Mans. Lorenzo had appeared strong again this weekend, as he had done in Jerez, despite feeling his third on the grid was one of the worst results of his career. A lightning start allowed the Spaniard to break away early, quickly able to pass Andrea Dovizioso on the Ducati and focus on riding his own race. One of Lorenzo’s strongest areas is his ability to run at the front and set incredibly consistent lap times when not having to battle with other riders. 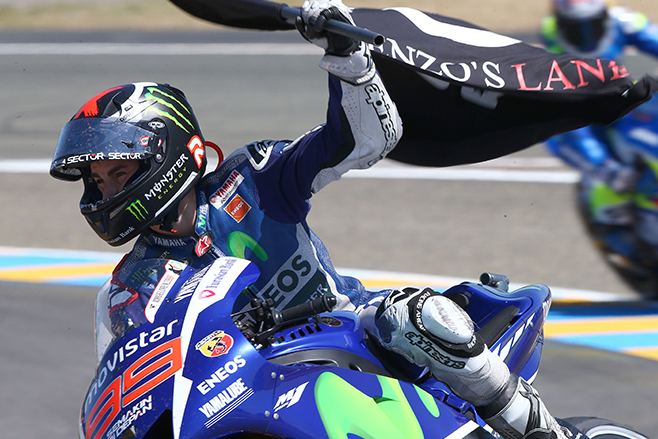 As in Jerez, Lorenzo demonstrated this incredible skill and was nearly untouchable. 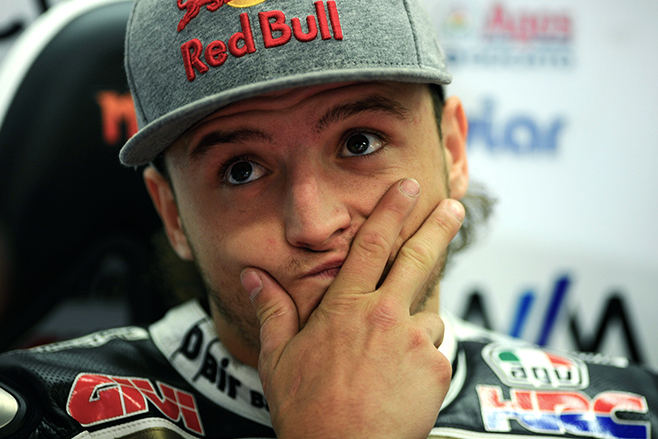 “I could overtake Dovizioso early and stay in the lead. I had to manage the one second gap and I had to push really hard even though the front feeling wasn’t great,” he said. This makes it back-to-back wins for Lorenzo and reignites his championship hopes after many had begun to doubt the Spaniard. The MotoGP™ paddock heads next to Mugello, a favourite track of Lorenzo and one that has seen several outstanding rides from the Movistar Yamaha rider. On his current form he will be difficult to match. While Lorenzo was surging ahead, Marc Marquez had a difficult start to the race, dropping as low as sixth before finding his form in the closing stages. The Spaniard quickly caught Andrea Iannone and Bradley Smith ahead, leading to a fiery battle between Marquez and Iannone. The duo swapped positions at nearly every corner, giving spectators flashbacks of their Moto2 days. The performance of Iannone was particularly impressive as he dislocated his left shoulder less than a week ago at a private Ducati test at Mugello. Marquez eventually came out on top as Iannone’s lap times dropped off significantly in the final three laps, no doubt feeling the pain in his shoulder. While the battle tore on behind, Andrea Dovizioso and Valentino Rossi had a brief battle, the Yamaha rider coming out on top. Issues in Jerez saw Dovizioso finish off the podium for the first time this year, this third at Le Mans is important for the Ducati rider’s championship as he sits in third with 83 points. “The grip after ten laps was not great, I struggled a bit. I couldn’t gain much in the braking. I didn’t have Lorenzo’s pace though. To return to the podium is important for the championship and us,” reflected Dovizioso after the race. Charging through the field, Rossi seemed as though he may be able to catch his teammate but the gap never dropped below one and a half seconds. It had been a less than ideal start to the weekend for the Italian as he and his Movistar Yamaha MotoGP team struggled with finding a good setting. Big risks in changes to the set up of Rossi’s M1 paid off come the race as he once again extended his championship lead, now 15 points ahead of teammate Lorenzo. 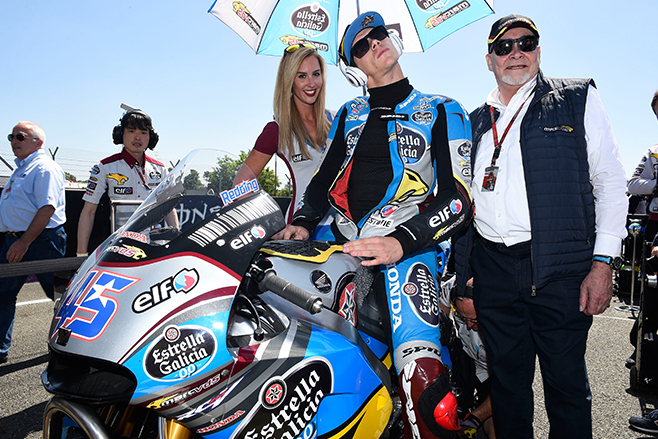 “We suffered a lot during practice because I couldn’t’ ride to the limit. We risked more with the set up for the race and I felt very good. 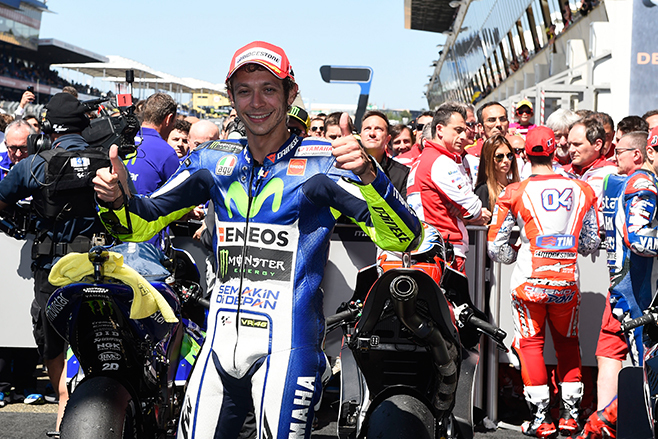 It took a couple of laps to understand it fully,” Rossi said. Le Mans was a difficult race for many of the British riders, both Cal Crutchlow and Scott Redding fell from the race in what was an overall disappointing weekend for many of the Honda bikes. The higher track temperatures on race day having a negative impact for the Honda riders who struggled for front end feel. Bradley Smith did well to finish in sixth behind the dueling pair of Iannone and Marquez after a strong showing earlier in the week. There were also reasons to celebrate for rookie Eugene Laverty, the Irishman scoring his first MotoGP™ points as he finished in 14th and as the second Open Honda bike. The Open category was led by Nicky Hayden, the American also qualifying as the highest Open rider. 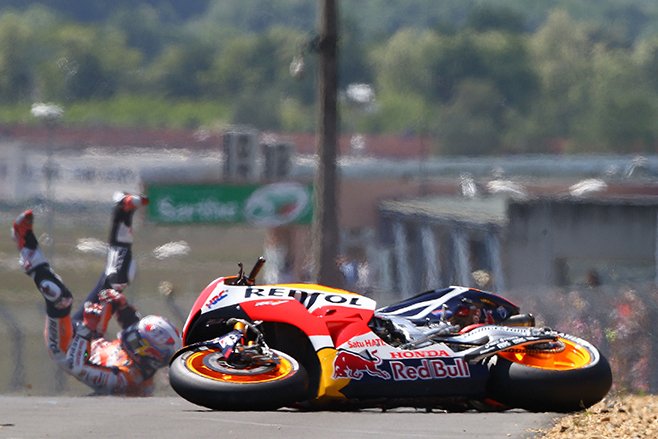 He and Jack Miller had battled during the early stages of the race, but the Australian fell as he existed Turn 4. Local rider Loris Baz also finished in the points in 12th, taking his best ever MotoGP™ finish in front of a cheering crowd. 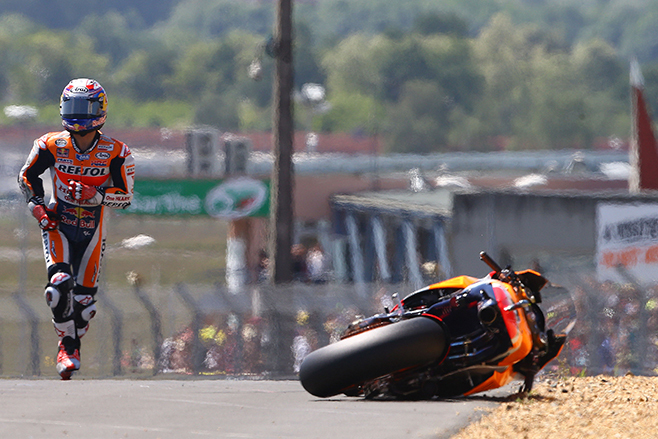 Miller was not the only rider to fall as he existed Turn 4, returning Dani Pedrosa also took a tumble there. The Spaniard was unhurt and remounted to finish in 16th, some 15 seconds out of the points. Stefan Bradl was another early faller as he continues to adapt to the Yamaha Forward machine. Both Aleix Espargaro and Karel Abraham were forced into the pits with technical issues, ending their races early. 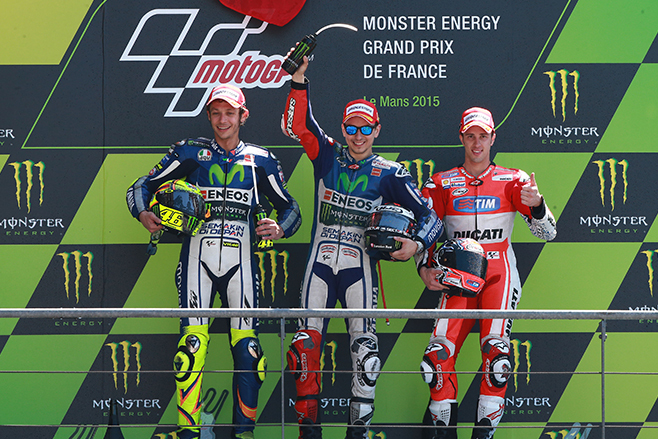 Look out for the full race report from the French round of MotoGP in the next edition of AMCN, out 28 May.